Is there a knitter out there that doesn’t have some sort of scrap yarn/left over yarn memory blanket forever on the go? It is something that gets picked up and put down so very frequently, where you only work on a square or two at a time, with perhaps many weeks in between. It’s a comfort, knowing you’ll always have something familiar to turn to, and yet perhaps a test of patience knowing that it is a long term friend who may stay a UFO for quite some time. I started mine in May 2016, and It will only have one square made from each skein of sock yarn I use, because a girl’s gotta have some rules! The squares get added after the project the yarn was initially used for or is complete, and, because of my Type A personality, I try to save the tag that came with the skein and a small sample of the yarn in a binder, where I might write some notes about the yarn, where I bought it, what it was used for, truly making it a memory blanket, attaching these memories to the pages. I first blogged about this blanket in late May 2016, and uploaded this picture. For a project that feels forever going, seeing the progress is really a happy thing. Happy 148th Birthday to my home and native land! As has become my new Canada Day tradition, I will be working later this afternoon as our Museum participates in our City’s Canada Day Celebrations. I am a few days late in writing a new post. My routine is to write and publish a new post every Monday, but the new house has been keeping me both busy and off my routine. I must also say, I was struggling for inspiration for a new post; Canada Day has, however, provided me with the inspiration I was seeking! 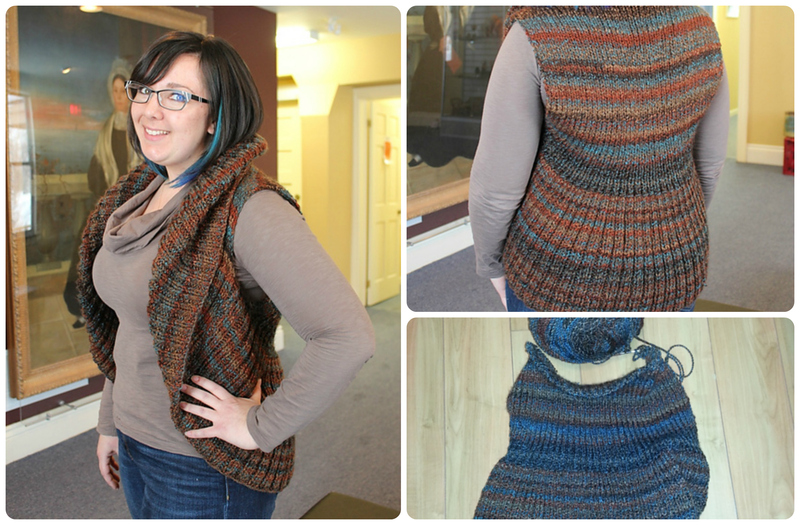 Here is a round up of some of my favourite Canadian-inspired knitting projects. I’ll start with the project I’ve completed: a Maple Leaf Toque. My dad requested a Canada toque, and I was happy to oblige. This quick project used intarsia to make the leaf, and the pom pom on top makes it complete! 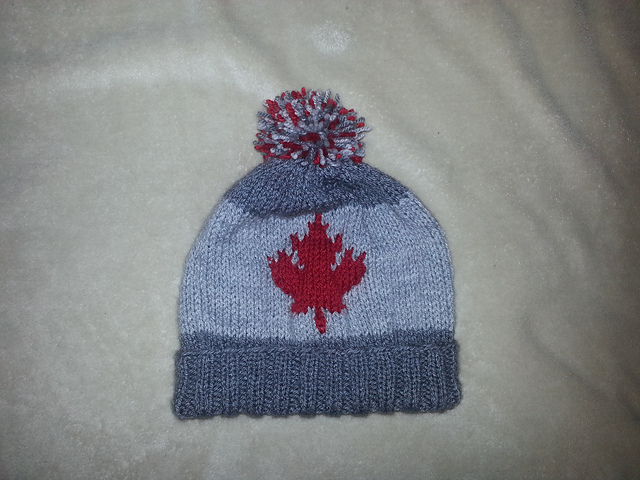 The Maple Leaf Toque I made for my Dad earlier this year. The Maple Leaf is such an iconic symbol for Canada, which is why this shawl caught my eye. Simply put, it is beautiful. The Maple Leaf Shawl, by Natalia @ Elfmoda, is available on Ravelry. It has been in my favourites for months, and one day I will buy the pattern and make this stunning wrap. Another iconic symbol for Canada has its roots in our early history. The Hudson’s Bay Company is the world’s second oldest company, and it was incorporated through a Royal Charter in 1670 as a fur trading organization. It has evolved throughout the centuries, and today it is one of the country’s largest retail business groups. The Hudson’s Bay Point Blanket, and the colours that comprise the blanket, date to c. 1780 and are easily identifiable and iconic of this company. The website hbcheritage.ca has a detailed summary of the history of the blanket, the colours, and the Point System that is referred to in the name of the blanket. #20 Hudson’s Bay Pullover by Cathy Carron, published in Vogue Knitting – I simply love the wrap the model in the picture is wearing! If you type ‘Canada’ into the Ravelry pattern search, you will get 201 results, with red and white in abundance. This last pattern caught my eye, as did it’s name. Canadian Pride 2010 is a free pattern available by Briggs and Little. Briggs and Little is a wool company based in New Brunswick, and I must say, I was rather impressed and surprised when I started looking into their history! The woolen mill was first started in 1857 and has been operating under the name Briggs and Little since 1916! This wool company is 10 years older than Canada has officially been a country. Canada Pride 2010 lives up to its name, with this zippered sweater featuring deer, maple leaves, and Canada emblazoned on the back. It literally screams ‘Canada.’ It looks warm and cozy, and I can picture someone wearing this while curled up by a fire. 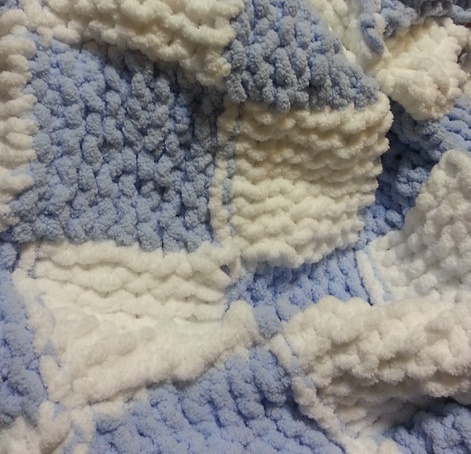 Author LTerechPosted on July 1, 2015 Categories KnittingTags blanket, Briggs & Little, canada, Canada Day, Canadian, HBC, Hudson's Bay Blanket, Hudson's Bay Company, knit, Knitting, Maple Leaf, Patterns, Points BlanketLeave a comment on Oh Canada! Really, this post is simply to show off pretty yarns. 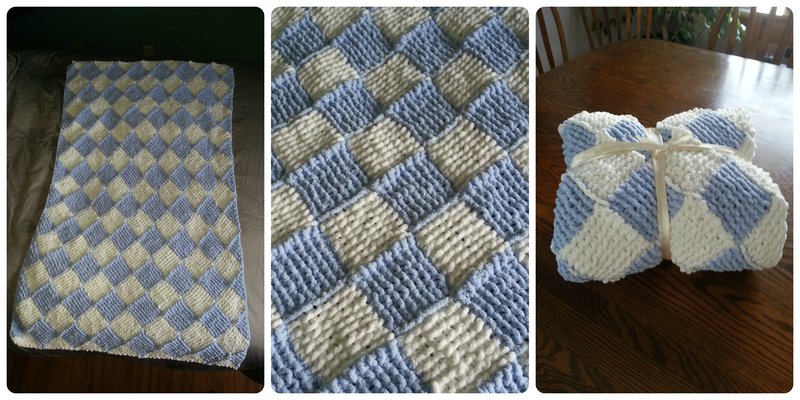 Earlier, I wrote about working on a baby blanket for a friend who is expecting. I finished it well before my deadline of the shower, and I was very happy with the final project. It is warm, soft, squishy, albeit a little heavy, but perfect to keep a baby boy all snuggled up. On my needles since early December, I bought the yarn and pattern from one of my favourite local yarn shops, Soper Creek Yarn in beautiful downtown Bowmanville. I worked on it on and off during those two months, and I finally finished it last Sunday! The colours really make this simple shrug as lovely as it is. I made it with James C. Brett Marble Chunky in the MC6 colourway. 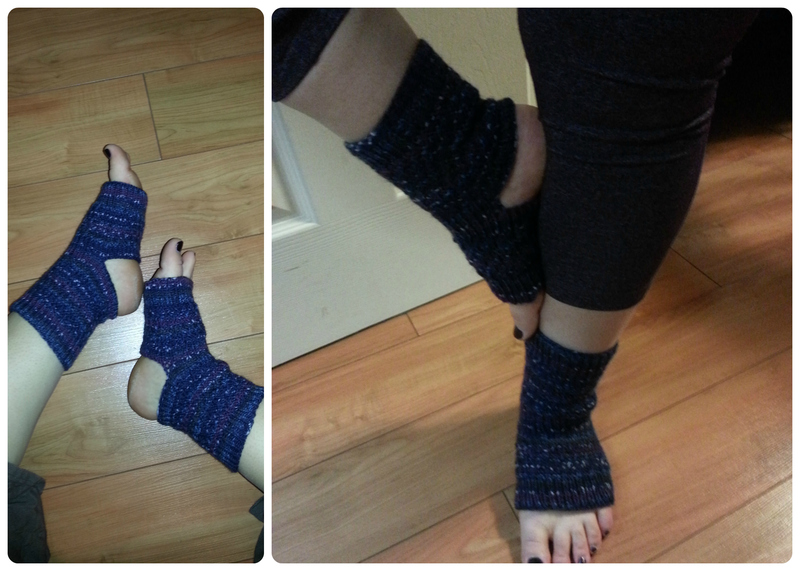 I must have been in a big knitting mood that Sunday, because I also finished the yoga socks I was making for my boss! I used the Paton’s Yoga Sock pattern, which had a lovely texture to it. When she asked me to make them, I asked my boss what colour she would like them in, and as a response I received an “oh, you know…” This was a very stressful answer! Ultimately, when I saw the colours in Schachenmayr Regia North Pole Color, I knew the deep blues and purples would be perfect! I’ll likely make this pattern again when I make myself a pair! The final project I’ll share again has a tie to Soper Creek Yarn. I bought the yarn to make the shrug during Bowmanville’s Moonlight Madness festival. It’s one of my favourite local events to attend. The town has its tree lighting, and the main street is closed to traffic allowing pedestrians and shoppers to leisurely enjoy the downtown, ideally with a hot drink in hand. That evening, I was able to get a few Christmas gifts purchased while purchasing a few goodies for myself, like the yarn! They had a raffle that evening, and I was able to put my name in the draw! Imagine my surprise when I received a call the following week, telling me that I won a door prize! The prize was four balls of Schachenmayr original Merino Extrafine 85 and a pattern to make with the yarn! 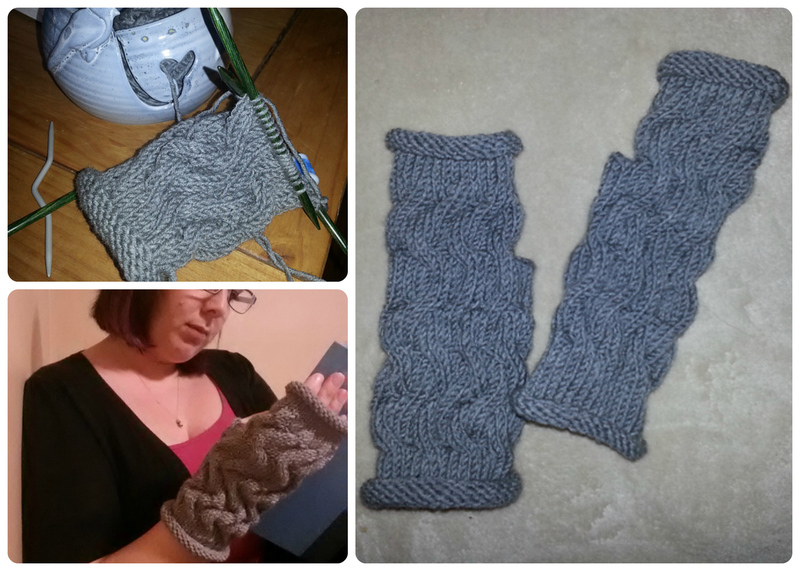 I finished the Wrist Warmers in early January and they are soft and grey and they make me happy. I’ve finally started my Midwinter Cardigan this weekend, how appropriate that I began this aptly named piece in the middle of Winter. Will stay updated on the status of this piece I’ve been waiting to cast on for months now! I am sure I’ve mentioned this before, but I am not a patient person, which is why my favourite kinds to projects to work on are usually quick with instant satisfaction. But, inevitably, there comes along a project or two that take longer to complete. That is what I am working on right now, two projects in particular that are not your average quicky project. The first project I started in December, and at this point, I’m only about half done. It is a pattern I purchased from one of my favourite LYS, and I know that it will look awesome once it’s finished, but the pattern is all ribbing. 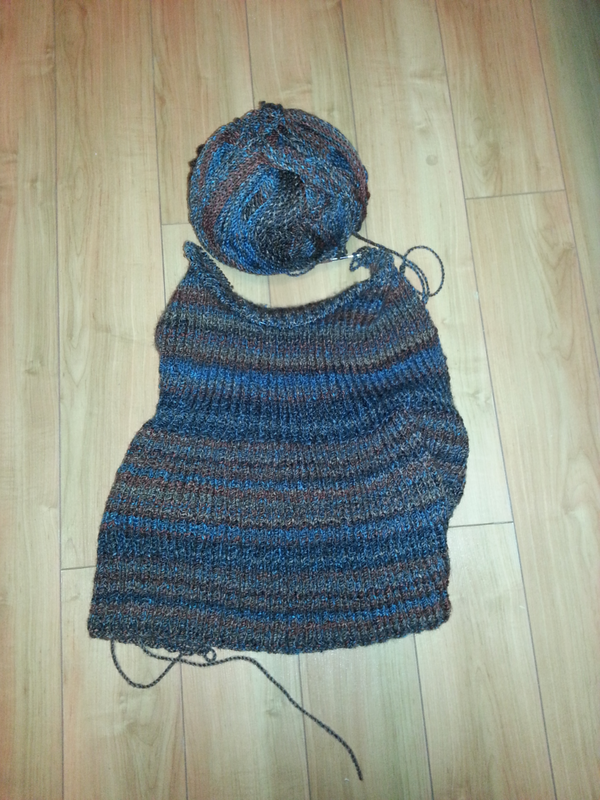 Inches and inches of ribbing. I’m making it with a lovely colourway from James C. Brett’s Marble Chunky, so the only thing that is quieting my impatience is, well, looking at the pretty colours. It’s not necessarily a large project, and it transports well, so I’ve found it to be a great project to take along to my knitting night on Wednesdays. Because the pattern is simple, I don’t have to concentrate on the knitting as much, and I’m able to keep up with the engaging conversations. My other larger project is not quite as transportable. In fact, it has some weight to it. This project is an garterlac baby blanket for my sister’s friend, who is having her baby in March. Over the holidays, we all got together, and my mum and sister so generously suggested that a blanket would be a lovely shower gift. Don’t get me wrong, I am thrilled to be making a gift for her baby, but the blanket was suggested with less than a month until the shower. So in early January, mum and I went and bought numerous balls of Bernat Baby Blanket yarn, and I proceeded to start this blanket. What has been great is knowing I have a definite completion date I have to hit, and the yarn is bulky so it’s knitting up fairly quickly. However, all other projects have taken a back seat to this blanket. And, I must say it has been lovely knitting this blanket because as I knit along, the project rests in my lap and keeps me rather warm! Because these two projects have been monopolizing my time, I haven’t wanted to start new projects. Once the blanket is finished, I will begin work on the projects in my queue. There is always the excitment that comes from starting a new project, and I honestly can’t wait to *gasp* BUY THE YARN! What do I have on the horizon? My fantastic boss has asked for a pair of yoga socks. Yay sock yarn! For this, I’ve got my eye on the Yarnspirations pattern. My dad has asked for a ‘Maple Leaf Hat,’ and I quote, “because, you know, the Canadian 150th anniversary is coming up in two years, and I want to be prepared.” Thanks to a Ravelry search, I’m likely going to make a Maple Leaf Toque from A Fresh Yarn, but with greys, not white and black, and I’m toying with the idea of omitting the rolled brim and instead doing a simple ribbed bottom with ear flaps. My dad would totally rock some ear flaps. Finally, my mum has put the bug in my ear that she liked Through the Woods hood from KnitPicks. Eventually, I’ll cast on my Midwinter Cardigan. Pattern is purchased, yarn is bought… the only thing I need is more time! In The Rounds Blog at WordPress.com.